National Park “Enchanted Land” is still quite young, but already has a strong position among the main natural reserve fund of Ukraine. 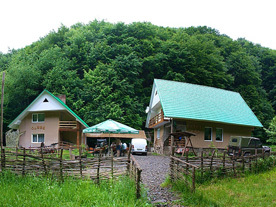 Established in 2009, the territory of Irshava district of Transcarpathian region with total area of 6101 hectares for the conservation, restoration and effective use of typical and unique natural complexes of Eastern Carpathians with important environmental, aesthetic, scientific, educational, recreational and improving value. 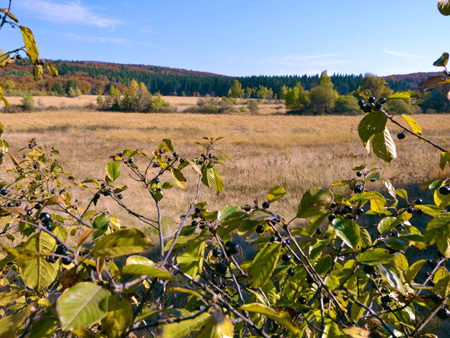 Here is located the most of the catchment area of one of the tributaries of the largest Transcarpathia river Tisza - river Borzhava, large areas are occupied by wetlands, beech forests, rich biodiversity, significant historical and cultural heritage are preserved, unique rocky landscapes were formed. Enchanted land corresponds to its name, is really charming, full of positive energy place that causes only warm and clean feeling. The first time hitting the “Enchanted land” you will be overwhelmed by the fantastic creations of nature. Huge rocks most bizarre shapes are scattered on stow. A little imagination and you will see the castle ruins, pyramids, silhouettes of animals, the teeth of a dragon or a human face. Oligotrophic sphagnum bog “Black mud” is the hallmark of not only Irshavschyny, Transcarpathia, and the entire European community. It is the deepest moss of Ukrainian Carpathians (depth of almost 7m), has a pronounced convex surface and covers an area of 15 hectares. 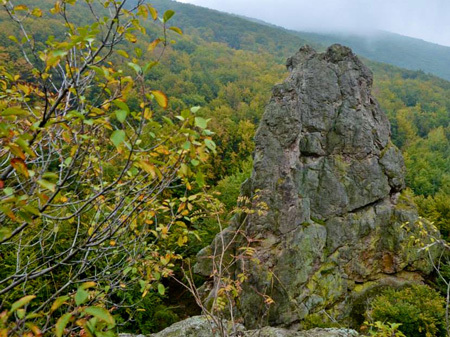 Geological reserve of local importance “Enchanted Valley” has area of 150 hectares, which is marked by a kind of rare forms of rocky terrain. Here as a result of water-aerial erosion having original stone formations up to 100 m. Some of them are named Rock, Stone Spruce, Stone Camel, Castle Ruins, Stone Throne. 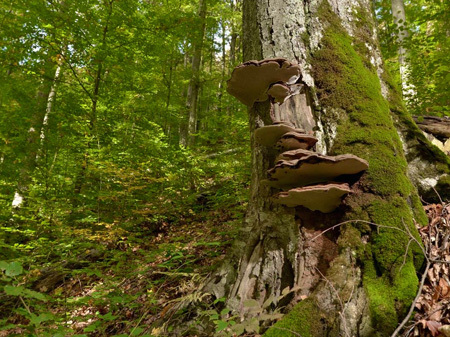 Primeval Beech Forests, rock works, waterways plateau in the upper reaches of the highest peak of Vygorlat-Hutyn volcanic ridge of the mountain Bujora - 1085 m above sea level. This object was submitted for consideration to the World Heritage Site by "UNESCO" in April 2014. 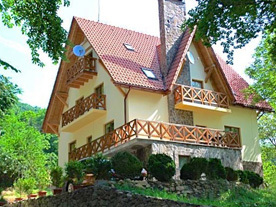 Nook in Transcarpathia for full recuperation alone with the silence and nature. 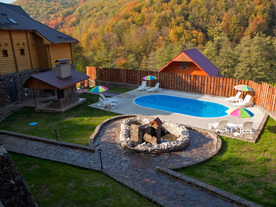 Recreation camp “Smerekoviy Kamen” is located in the natural park “Enchanted land”. Here you can enjoy the peace and unity with the surrounding nature and recharge by its life-giving energy. 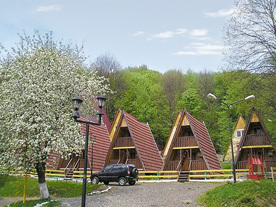 Tourism and recreation complex “Enchanted Valley” is located in the village Osiy, on the territory of the national park “Enchanted Land”. Nearby are a small rope tow and a hotel. Manor “At Petrovitz” is located 4 km from the village Osiy center and from the road, near the manor flows mountain river Synyavka. There is a high species diversity of flora in mountainous landscapes due to a large variability of environmental conditions (different exposure, slope, different climate zones, etc.). In the territory of the natural park “Enchanted Land” were found about 1500 species of animals and 8,000 species of insects. Among the identified 32 species are listed in the Red Book of Ukraine, 11 – in the European Red List, 36 species – in the Carpathian list of species threatened. Vertebrate fauna of the park is typical for the lower part of the forest and foothill zone of volcanic ridge. In total there are 5 species of fish, 8 species of amphibians, 8 species of reptiles, 86 species of birds and 34 species of mammals. Workers of the park found a colony of beavers on site of oligotrophic bogs “Black mud” at an altitude of 840 meters above sea level. This is a unique case. Reed Beavers originated 10-12 million years ago in southern Europe. It is characterized by band settling on riverbeds. Beaver – is the largest river rodent whose body length reaches 120 cm, weight - 20-25 kg. Main food are aspen, willow, birch less. This is typical for the locality where they were found. Natural park “Enchanted Land” is the center of environmental education, training and improving the environmental culture of the population. The institution also is working on environmental education, recreation, eco-tourism. Workers of “Enchanted Land” conduct educational and informative tour marked by environmental paths and routes; cooperate with domestic and international government, NGOs of environmental and conservation area, educational institutions; give lessons on environmental issues involving school children and adults of different social groups to conduct mass ecological actions, contests, quizzes, form-based institutions training center in environmental education and educational work.